The trek begins by walking up through apple orchards and pine forest past ruined Jele Dzong (fortress), which sits on a high grassy ridge with breath-taking views of Mount Jumolhari to the north. In the next 4 days, we climb above the tree line and cross several passes, including the Phume La (4200m.). 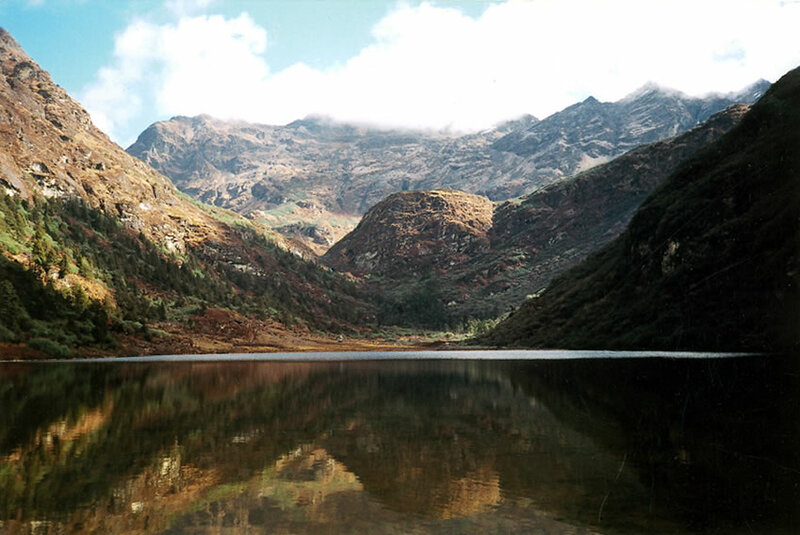 En route, we come across clear mountain lakes, number of yak herder’s camps and have splendid views of Himalaya along the Bhutan – Tibet border including Mount Jumolhari, Jitchu Drake and Gangkar Punsum. 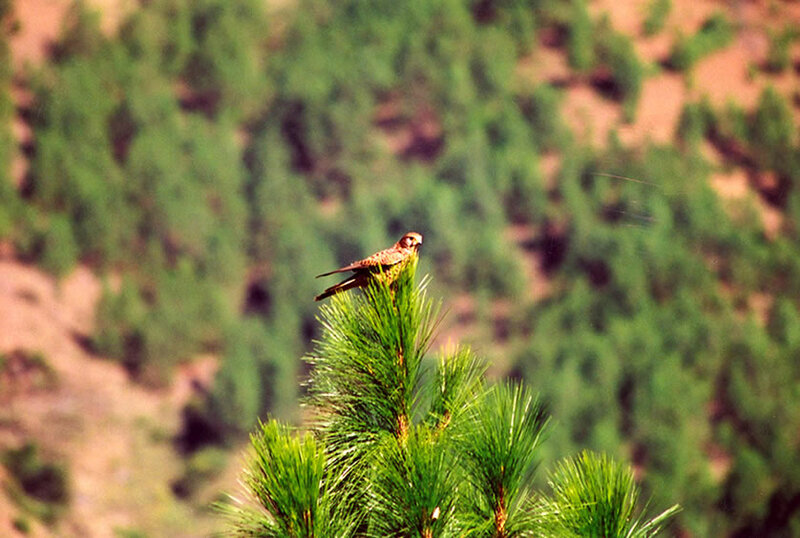 Our final descent through pine and juniper forests via Phadjoding monasteries would lead into Thimphu, the capital city of Bhutan. The start of the Drukpath Trek is at the historic Ta Dzong, the National Museum. We follow a dirt road until it gives way to our trail in the pine forests. The trail is uphill all the way till Jela Dzong, a temple built as a war fortress in the olden days, overlooking the Paro valley below. Today’s trail looks like the setting of Stephen Spielberg’s Jurassic Park. With ancient firs wrapped in Spanish moss, a dinosaur or a Bhutanese Yeti might actually surprise you around the bend. You may see yak herders around the campsite. The trek today starts off with a climb, overlooking the rolling valleys below. 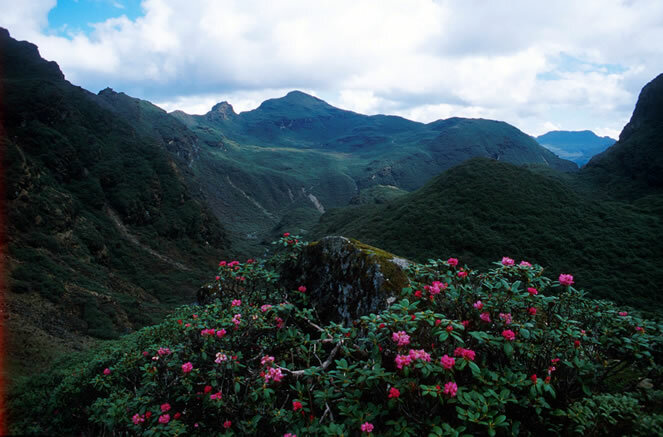 Rhododendrons and other high altitude shrubs decorate the rocky trail which climbs up and down. On a clear day the Jumolhari can be seen. Our camp is at the lake of Jimilangtsho. The trail will take us through dwarf rhododendrons and junipers. We will also pass the lakes of Janatso and Simkotha. The view of the far ridge across the valley which you trekked will fill you with a sense of personal satisfaction and renew you with extra confidence in yourself. Tonight is going to be the coldest of all our camps. An hours’ climb from the camp will take us over the highest pass on this trek at 4100m. 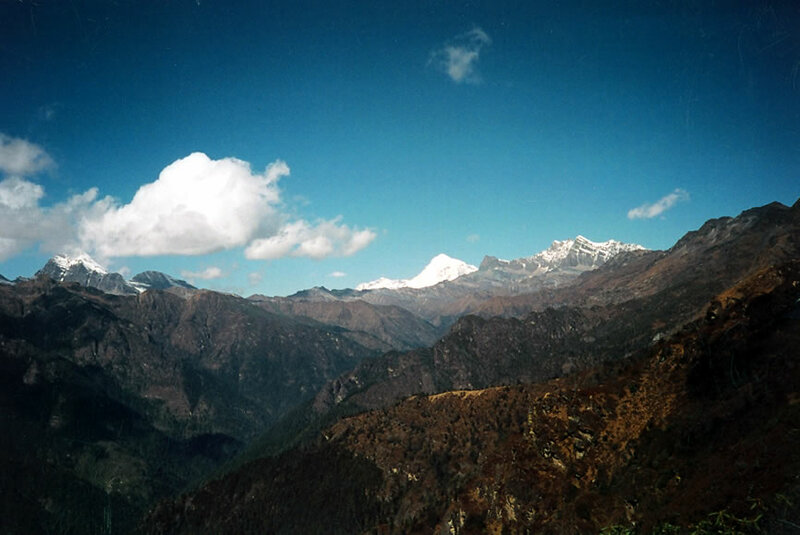 On a clear day we can see the Gangkhar Puensum, the highest peak in Bhutan. Descending from the pass over rocky steps, we will be greeted by the sight of Thimphu far below in the valley. From this point on, it’s all downhill. We will be passing through the temple and meditation center complex of Phajoding. Our transport will meet us just as we start emerging from the forest and drive to Paro for our departure flight next day. The drive will take slight more than an hour. Transfer to airport for your departure flight. Our tour staff will bid you farewell at the airport.